Create excitement on the casino floor by using a lottery-ball machine for dozens of creative casino promotion ideas. More and more properties are incorporating lottery-style promotions into their monthly casino promotions. You can go with traditional lottery theme, or consider the draw machine as a prize board which greatly expands the themes and concepts. A lottery machine can be used for “add em up” style games where the player must total to a certain number of points, yards or dollar amount. Or, maybe you collect certain colors or symbols. With the draw machine, you don’t need an envelope, which makes the draw result faster and more visual for your players. Below are a few concepts to get start. Contact Smartplay for more casino promotion ideas. If balls add up to a specific number (e.g. 200), the player wins the grand prize. Certain balls or amounts could be designated for special prizes. As numbers are selected, the temperature goes up and the player wins more money. Or player reaches prize levels as they move up the thermometer. Player progress is noted on the thermometer scoreboard. Bring two or more players on stage. Draw numbers from the machine for each player. The first player to make it to a certain number is the winner. Create a prize board that tracks a path for each contestant toward the big money. If one player totals an exact specified amount (e.g. 100) they win an insured or guaranteed grand prize. Race (colors and numbers) – for an added twist, use multi-colored balls with numbers. Contestants are each assigned a color. The host selects balls and numbers revealed are applied to the contestant matching the ball color selected. Football Cash – Similar to race concept, the numbers revealed are yardage amounts. Two “teams” are playing each other, trying to make it to the end-zone first. Football field prize board adds to the visual presentation. This same idea could be used for other themes — horse racing, auto racing, track, and field, etc. 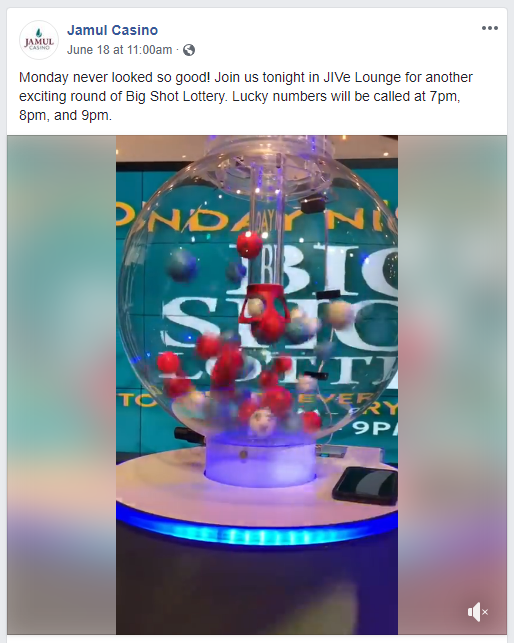 Lottery balls are then revealed one at a time on stage and prizes are awarded accordingly based on matches. This is a promotional game that plays similar to roulette. Lottery balls are drawn and players earn points or dollars based on the result. MultiPick draw machine draws multi-colored balls. Multi-colored balls are placed in the chamber. The object is to reveal two or more balls of the same color. As long as you do, you continue to progress. The player could have one or more “saves” so they don’t lose on the first attempt. Distribute scratch cards, which could be designed to play one or more games. More secure cards could be distributed for higher-value prize giveaways. Players could win tickets which play for the next drawing. Tickets could be good for one or more of the automated drawings. For example, a ticket could say “good for any drawing on Wednesday” or “good for any drawing between 4 and 6 pm in June. This process could also be automated, based on visit frequency, coin-in, etc. This concept would use the Draw Station noted above. The guest gets a random number between 1 and 200 texted to their phone every 30 minutes. The player can walk by the machine at any time to see if their number matches. If the number matches, they get X in free play. This is just start. Contact Smartplay for more casino promotion ideas and a list of our lottery-machine rental inventory items.